There is one Transformer that towers, quite literally, above all others. Fortress Maximus. Released just as the franchise was preparing to transform into something that jumps sharks, he was prohibitively enormous (not to mention expensive), making him unobtainable for most 80's kids and thus also making it one of the most sought-after toys of today. He can easily go for over $1000 on sites like eBay, but for the less serious collector, salvation is at hand: it looks like the "figure" will be re-released next year. A listing on toy superstore BBTS has turned up for Maximus. Priced at $399 he's still super expensive, but this thing won't just satisfy a childhood dream, it'll let you ride in the carpool lane to work as well. 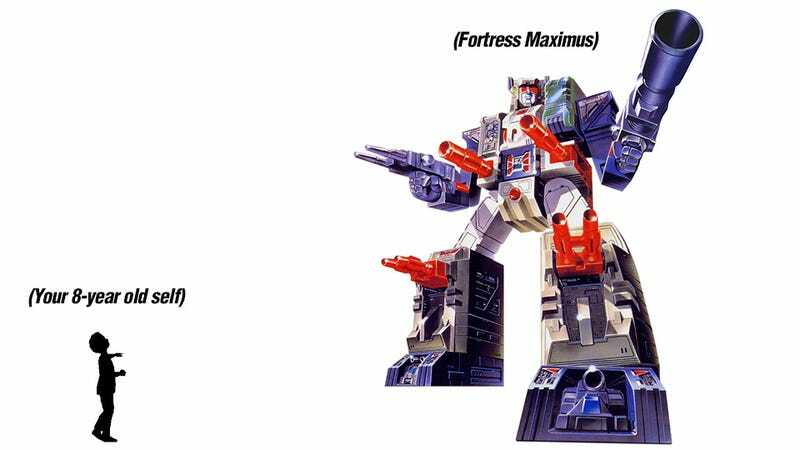 The original Fortress Maximus (and not his later "repaints") has not been available for sale since 1987.